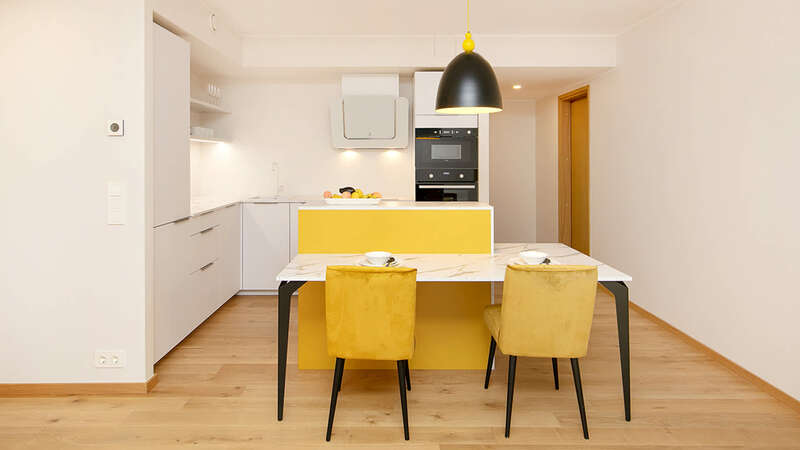 The flats, which are ready to move into, are located in the Tallinn city centre on Jakobsoni Street, just a few hundred metres from the city’s best restaurants, Stockmann’s department store, Maakri business quarter, as well as the cinemas and theatres. There are three elegantly small and private buildings in total, each with four or five floors. The flats have different and interesting room plans, with some of the more exciting ones featuring split levels. Special attention has been placed on the spacious corner view living rooms. Most flats have a spacious balcony or terrace. A beautifully landscaped, fenced courtyard makes the building cosier. The courtyard contains resting areas and a children’s playground. 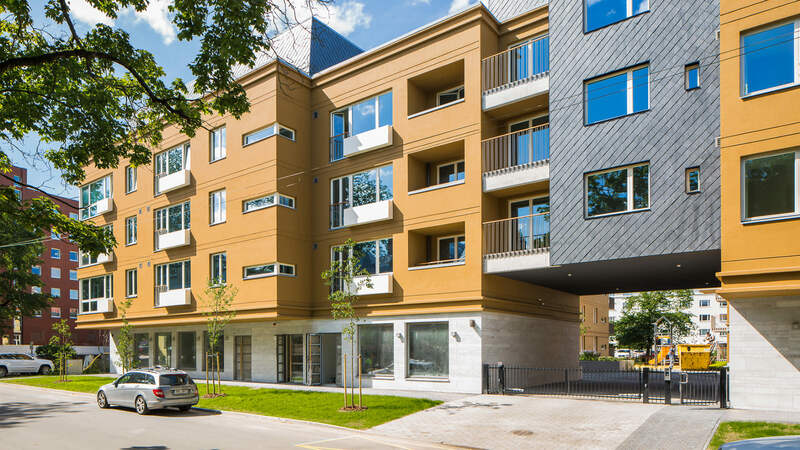 Convenient and safe resident’s parking is provided by the underground parking garage, which is directly accessible from the buildings’ stairwells. The Jakobsoni 7 project consists of 75 one to four bedroom flats with the ground floor containing four commercial spaces with spacious showcase windows. The building has been given a B class energy label. Territory and parking. The territory will be tidied and turned into greenery, outdoor lighting and playground will be established. Garbage room will be a separate room in the building next to the street, access from outside. Parking spaces have been designed to the joint basement floor of the buildings. The garage gate and entry gate to the real property are openable with mobile phone. Windows, balconies, railings. Wood-aluminium windows of the buildings are with triple glazing. Finishing surface of balconies will be uncovered natural concrete. Thin metal railings will be covered with wooden handrail. Storerooms. Storerooms are located in the basement of the buildings. Structures of buildings. Load-bearing structures of the buildings to be built on plate foundation have been combined from prefabricated and massive reinforced concrete, including intermediate floors, partitions between apartments and balconies. Reinforced concrete intermediate floors will be covered with insulation and concrete surface casting. Light partition walls of the apartments are made of metal framed plasterboards and walls of shafts from lightweight blocks. Insulated attic floors will be covered with rolled material. Facades of the buildings are for the most part covered with stucco, with limestone and slate surfaces as accent. Interior finishing. Stairway floors are tiled, walls puttied and painted. Floors of the apartment entries are with ceramic tiles, that of living-rooms with natural parquet. Ceilings and walls are puttied and painted. Floors and walls of bathrooms are tiled, ceilings are smooth plasterboard suspended ceilings puttied and painted white. External door and internal doors of apartments are wooden doors. Water and sewerage. Wash-basins, faucets, dual system toilet bowls, and water and duct connections for the washing-machine have been installed to bathrooms of the apartments. There is a bath or shower in bathrooms. Water supply and sewerage is completely behind the wall or under the floor in the apartments. The apartment plumbing inlet from the shaft is located above the bathroom suspended ceiling. Opening and closing valves and hot and cold water meters have been installed. Heating. The buildings are connected with central district heating of the city. The apartments have underfloor water heating and heat-flow gauge with remote reading. Ventilation. The building has apartment-based forced ventilation with heat-recovery. A separate air outlet has been designed above the stove to be connected with the hood. The hood will be supplied and installed by the purchaser. Electrical installations. Heavy and low current switchboards of apartments are located in the entry wall recess or in the storeroom. Two-tariff electricity meters are located in the switchboard room. Bathrooms have electrical floor heating, controllable by the floor sensor and temperature controller. Ceiling luminaires are installed to the entry and washing room, other luminaires will be supplied and installed by the purchaser of the apartment. The apartments have door phone systems and automatic smoke detector. Security alarm system availability: finished cabling for installation of the keyboard and external door magnetic sensor (supply and installation of the equipment is not included in the purchase price). Modern CAT6 data transfer cable, providing higher data transfer rate, and TV-cable will be installed. Owner of the apartment can sign an agreement with cable television, phone and data communication service provider to his liking.